Out of the need for fast work in a confined environment was born the idea of a bulldozer quite unlike any you’ve seen before. We meet Roger McMillan and his Microdozer. Today's modern machines always boast the latest and greatest technology, vastly improved operating efficiencies and bullet-proof reliability. Operator comfort is always paramount and the air conditioning system affixed to your bog standard out-of-the-box excavator will probably put the unit in your average $80,000 SUV to shame. But one commodity much harder to come by these days is 'character'. That unquantifiable aspect of any machine's make-up tends to come with age. Unless of course it's a shed-built skunkworks prototype unlike any other. Something like the McMillan O'Halloran Microdozer, for example. This thing has character in spades. And once you meet the mad scientist behind this wee beast, it's obvious. Because Microdozer builder Roger McMillan is definitely something of a character too. I meet Roger at his sprawling property in Lower Hutt, high on a bush-clad spur at the fringes of Belmont Regional Park. His steep and twisty driveway snakes its way up the hill for a full kilometre before popping out at the top. After my hire car has wheezed its way up, I'm surprised to learn Roger's equipment shed is on site up here and he winds his way up and down in his excavator-bearing work truck as a matter of course. Once you get up to Roger's place though, it's easy to see why he built here many years ago. In fact, as a 10 year old, he would walk this ridgeline — about four kilometres from the house he grew up in — and dream of the day when he could buy the land and build. He and wife Diane eventually did just that and have now been here 36 years. Take a peek in Roger's basement garage and you soon realise you could stay up here far longer than anticipated, too: for those of the two-wheeled persuasion, there's plenty to see. Roger has spent a lifetime riding, racing and collecting motorbikes and today his garage proves quite the distraction. I tear myself away from the man cave to check out another fine piece of machinery. At 66, Roger has the energy of a man half his age... which, as I discover, is possibly a handy trait, given the complexity of the McMillan O'Halloran Microdozer build. "It seemed like a good idea at the time!" he laughs. Roger fills me in on both the reason why he wanted to manufacture such a compact piece of kit, and the Microdozer's mechanical beginnings. "The bulk of my contracting work these days is for engineers and insurance assessors, the agents of the Earthquake Commission, but traditionally I deal with a lot of garden landscaping work," he explains. "I'm always working in confined, generally urban spaces and, even with a two-speed excavator, the work can be quite slow going. 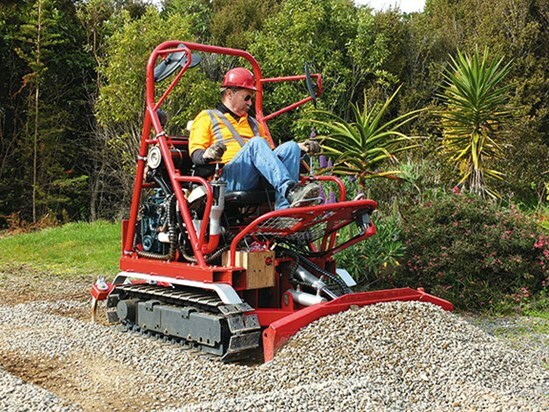 "The Microdozer is an absolute rocket ship in comparison, allowing for high-speed landscaping. Currently it's running a Kubota four-cylinder capable of around 42hp. The machine only weighs one and a half tonne, making it fast. That'll help make the working day much more productive." Although it's essentially unrecognisable as such now, the Microdozer began life as a tracked, radio- and computer-control bomb disposal unit manufactured by Kubota in the wake of the infamous sarin gas attacks on the Tokyo subway system in the mid-1990s. "I was on my way to an equipment show back in 2003 and an Auckland importer was selling these ex-bomb disposal units. They were part of a load of damaged stock — the container they were in got dropped at the wharf or something — so I made him an offer and trailered one home. "It looks utterly different now of course. It was twice as long, with big ugly body covers on it and a grabber at the front. I threw most of that away and started again. Essentially everything you can see that is blue-grey in colour — the motor, the centre frame, the pumps and the tracks — are original items, while all the red or silver parts are components that John O'Halloran and I planned, drew on the floor and then fabricated straight off the plan," says Roger. The remote-control nature of the unit made for a tricky rebuild, with the electro-hydraulics causing a few headaches. In fact, while the Microdozer is essentially complete, Roger is still fine-tuning the flow controls and the electro-hydraulic parking brake in order to make it industry standard. "The hydraulics in particular are incredibly complex. But a lot of people who are experts in their field have been instrumental in the build. People like Grant Lamberton, who plumbed in all the hoses — which was a massive job — have been invaluable. And John Stewart at pump and valve manufacturer Brevini New Zealand has been incredible — always there with equipment and advice when I needed it. Richard Scott, Ian Wood and many others have also had a lot of input." As for the Microdozer's full name — inscribed in relief at the top of the machine's blade — Roger says long-time friend John O'Halloran was the other mad scientist behind the build. Although surprisingly it isn't the first time the two have thought... well, small. "The first project John and I worked on together was a Microtruck," Roger tells me. "It had a full tip-truck set-up with swing tailgate and tie-downs, but was only 800mm wide. It was powered by a 6.5hp Honda engine belt driven through a Daihatsu N360 two-stroke crankcase, paired with a narrowed Datsun Sunny diff. It was a bit of a mongrel, but it worked like a dream." While it turns out the Microtruck had a degree of interest from some major industry players, Roger isn't as keen on trying to sell the idea of the Microdozer. "To be honest, it's such a complex machine. I'd like to get it to the point where it's a serviceable tool for my business, but I've always thought of it as more of a calling card for Roger McMillan Limited, as opposed to a blueprint to market and sell. "It certainly works as an attention-grabber though. You only have to stick it on the back of a truck and take it into town to get people pointing and staring and asking all about it. It's a great little machine and goes well. It has cost a lot of time and money to create it, but I'm proud of the work myself and a host of others have all put in to get it finished," he concludes. All I'm left wondering as I head back down the driveway is which has more character — the man or the machine?